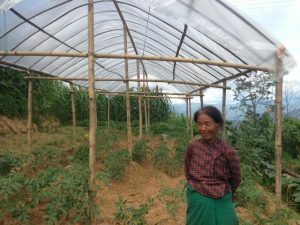 Over 50 greenhouses have been built with the most needy of the villagers elected by each village to receive the greenhouse. 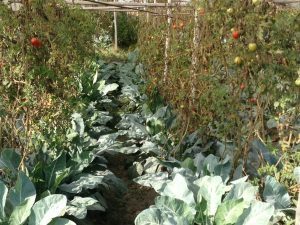 This offers year-round organic farming as income to the recipient, adding to the meager income they get from only two seasons in the fields they work each year. Because the produce is organic, it fetches a higher price at market. 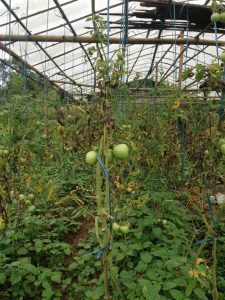 The R Star greenhouses produce up to four crops a year, and in some cases five, using only organic seeds. Each Greenhouse costs about $850 to build. If you’d like to help with this cost, please contact us. Built by R Star between 2007 and 2009, caters to pre-K through 5th grade. 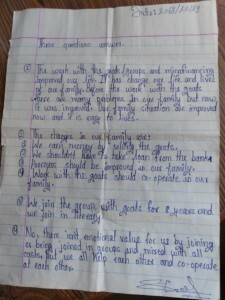 Girls attend free of charge and lessons are taught in English. 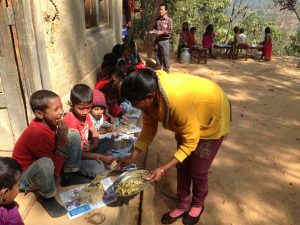 Students are exposed to the world outside their village with the use of Kindles and books, and are testing in the top 10% of the country. Unfortunately the building was struck by the 2015 earthquakes and has yet to be rebuilt due to funding and building issues throughout Nepal. 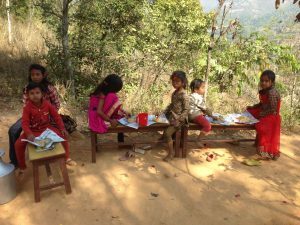 The students are still learning, using tarp covered areas, but the threat of snakes and tigers looms nearby as there are no walls to keep the children safe at school. If you’d like to help rebuild the school, contact us. 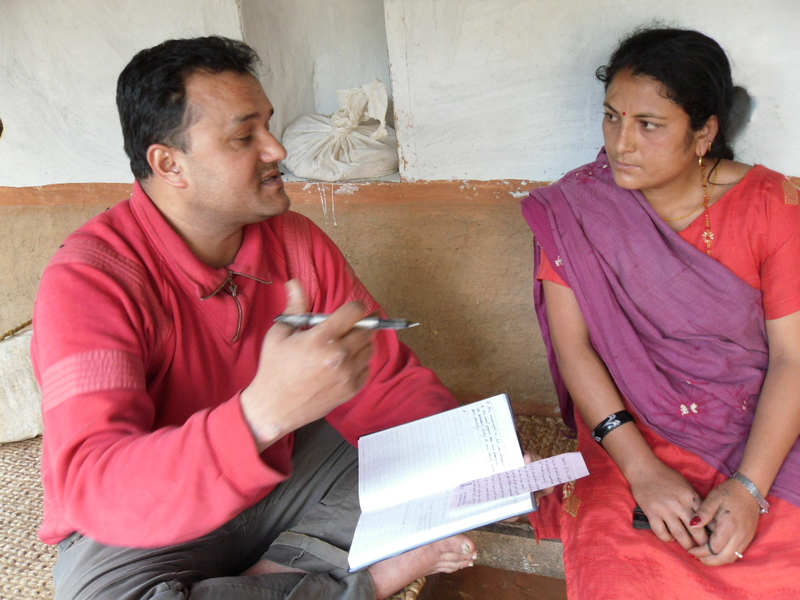 Sharmila’s husband: “At first I had doubt and didn’t understand the purpose of the work. I thought something good was happening when my wife joined the group brought to us by a woman Rosalind of R Star. I didn’t know it would impact so much but after a few years we realized how much of a positive way it went. I’m very happy my wife is a part of the project. W e never fought about the income she was producing; my wife ran her finance that she earned which has never been the custom of this little country. (A woman’s money is not hers but the husband’s or head of household.) It took a great burden from me with her ability to add to our otherwise poor lives. We are grateful for the program”. 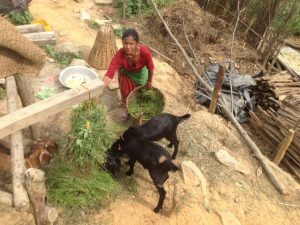 Has the work with the goats/groups and micro-financing improved our life? The lives of your family? Yes, of course you know that. After you people started goat groups and gave us goat we have been always gaining so many things. HOW and WHAT are the changes you, your family have benefited from? How many in your family? Ah…First change is we are now united and can solve our problems with the help of our own group. We have our own fund for the needs that overcomes at times such as sickness, delivery cases, you know.. two women in our village died at the delivery time suffering because their husband didn’t took them to the hospital due to lack of money. Not only that we can now also fight other accidental cases, such as fire and falling down from the trees. We can purchase seeds & fertilizers on time lending money from our group fund that makes our agricultural product better. Most important improvement is we have our own property as goats and we have made such a good income by selling the products. This year only I have 5 male goats ready for the market. I hope to make about 11 hundred dollars this year. So that means I make nearly one hundred dollars a month. Yahoo! We do not have any landlords who made a fortune by lending money to us with 70-90% interest and free labor. Thank you Rabin and our beloved sister Rosalind. 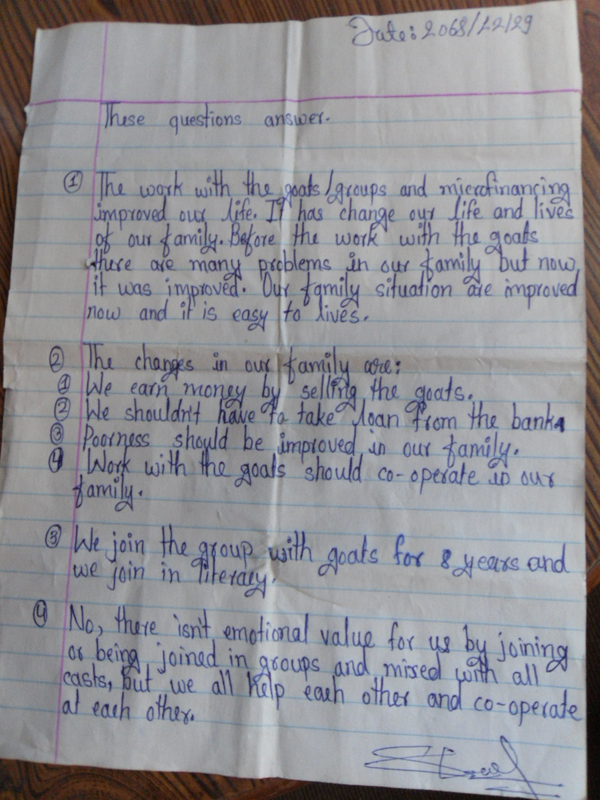 What year did you join in the R Star groups with goats or literacy or cottage industries? I joined the goat project in the year 2003/4 and cottage and literacy in 2008 and 2010. I think when we talked about goat project to be established, you had not started it anywhere..aha..haa.. So I think I am among the first. Is there emotional value to you by being joined in groups as you are, mixed with all casts? At first not all the members liked the Idea of being mixed- in but later on they came to realize that , the truth is we are women and we have same problems so we must consider ourselves as one cast “WOMEN!”, I think we are more comfortable with each other now then..ever before. Is there anything you would like to share beyond these questions? Yes, I have great respect to you and your mother , you know how I suffered when my dad passed away in an accident (fireburn) when I was just 15 years old. I had to take care of two younger brothers and two younger sisters , as being the eldest I had a huge responsibility, I know the cruelty of poverty and the cruelty of our society, I use to think that my time will never change but thank you again , not only mine everybody’s changed in our village as I can see … NO MORE STARVATION! I think without a group our lives will be far more difficult because we now have a sense of unity and our members are very helpful to each other. We do speak and listen to each other’s sufferings and unite to help her. Men now do not take us as “nothing”, now we worth a lot in our family and community. Micro-financing made us capable to solve each other’s financial problems by ourselves and it also saved a great deal of “FREE LABOR” & huge percentage of interest that we had to pay back to persons with whom we use to take loan, we now also have collected our share and it has increased satisfactorily. We don’t need to take loan to get ourselves to a hospital and to buy fertilizers for our field. Our group means a lot to us. We are five in my current family. I joined a R star Group with goats in the year 2003/4, women literacy in 2008 and cottage industry (Making candles and tailoring) in 2010. OH YES, I as a Dalit (Untouchable) never thought that I will be leading women from all caste especially high cast. The group meetings and all the training and literacy classes made us touch each other without any hesitation, these days we women treat each other as SISTERS no matter which cast. WE FEEL TOGETHER. Finally with goats and micro-financing fund, now am free of loans, FREE FROM FREE LABOUR. I made a 24 carat gold necklace saving two years interest money and the paid labor money I made. I also made a gold ear ring for myself, my husband is so happy that what he sends today is 100% used by the family, even saved little by little. I thank Rabin Babu for his heart towards us, I thank and keep his mother in my heart for ever, we never saw and felt the love she provided to us, ever before she visited us, I and my group always keep Rosalind Sister in our heart , WE LOVE YOU SISTER! 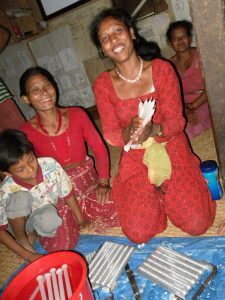 Has the work with the goats/groups and micro-financing improved your life? The lives of your family? Yes, you bet ! I am single and had no one to look after me. I caught in fire before 14 years. My dad and mom passed away a year ago I caught fire. Both my legs up to heap is burned, Rosalind also have seen my burnt legs.. My brothers kicked me out of the family and I got no one to care about me, I could do no labor because of my ill body. 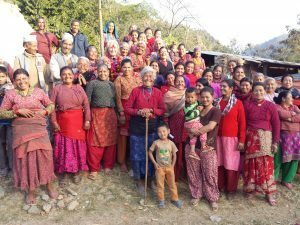 I have been working in “SUNKOSHI Adventure Retreat” since 12 years. I had no community but now I am respected as a president of the group and I have a huge community, it is all because of YOU and your kind mother Rosalind, our loving sister. Well, I as an individual have benefited from goat raising, I am saving the income for my old age, I had no other way than to die of hunger and lack of illness the day I could not work at the Resort I am working because my salary here is just hardly enough for my treatment, food and my clothing’s. I can now read and write , “remember?” I use to raise my thumb for the signature ? Now I can sign , not only that I can read and write, make the measurements for tailoring, I know how to make candles as you have provided candle dye machines many of my group women are doing their candle business, I am not making it since I will not have enough time from my work here at the Hotel, but tailoring is my interest and I will keep on doing it. HOPE is there in my life and that only makes our days bright and happy, don’t you see my face happier? Ah.ahaha.. I am thanked and honored for leading this group, I never thought I would be so important one day…BUT I AM. We joined the goat group in 2007. Literacy classes in 2009 and cottage industries in 2010. Oh ho..yes quite a lot. 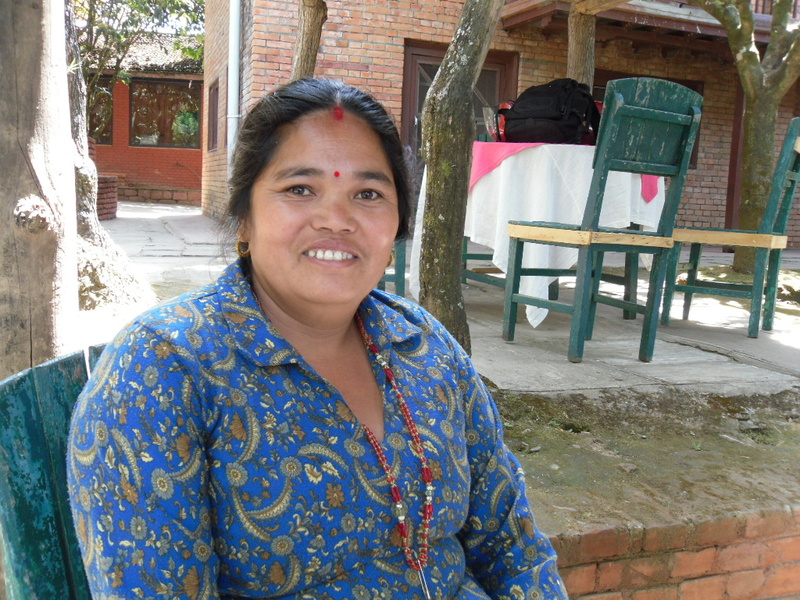 I as a Tamang ethnic minority woman is now a president of many Newar, bramins, chhetri & Dalits women. The group provided us great opportunity to co-operate in our mixed cast and cultured society. Whatever egos were there before joining in the group is no more there. We are very co-operative and our group women now are stronger being united in the society. Women in our society are much more democratic than men. The opportunity provided to us does makes a change in our society, our country and of course the world as a whole. You both mother and son did such a great job of uniting women and uplifting their dreams. Thank you both. Well, I would like to share everything in my heart but just do not know what else to tell. “Is Rosalind Sister’s residence built again?”(she changed her facial expressions and was serious without a smile while asking me this question, I replied No.) We know she will have a grand home for her because GOD will make it happen. Please tell her our blessings and prayers are always with her. These answers were written by the interviewee’s daughter demonstrating her new found literacy. Yes, of course lot of things changed and our living also changed. We are no more one, we are a “POWERFUL GROUP,” now. My kids are getting good education, my daughter passed SLC (School leaving certificate) this year. We have cash in hands, goats in pens and skill in our hands. We can read write and make calculations…what more do we need? As I told you having skill made us start cottage industry, I make candles and sell them regularly, thanks to load-sharing my candles are sold easily. I can sew clothes, we get handsome amount by selling male goats 4-5 every year. 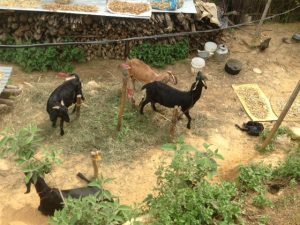 I sold one male goat in 17500 rupees (210 dollars) last Dashain, I have 3 male goats and two of them are ready for sale. I also have opened a shop and I am able to run it all by myself now because I can read the price and do the calculations all by myself, my husband do not need to oversee it. Now he works as a farmer. Our family takes us as the valuable member, we did not get this kind of treatment ever before. I am sure no one would help us as you and your mother did. We have a huge space for you and our Sister Rosalind, Thank you for all you‘ve done for us… I don’t know if we could ever pay back to Rosalind….We are 7 in my family. I joined the goat group in 2007. 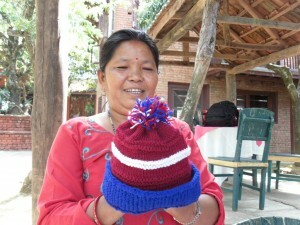 Literacy classes in 2009 and cottage industries in 2010. Yes, there is. Before joining the group we were divided in different casts but now we are a “powerful group of women,” we are the ones who run our family. There is no cast egos and we all are united in the name of group. It is something I never thought would be easy to unite and be mixed, but in few years time in the group changed many things. Yes, because of your kind heart and effort our lives changed forever. Women mostly discriminated and mostly victim of domestic violence are now respected member of the family not only family also in the community. We don’t know how you people came suddenly and pushed us to become stronger and stronger. You both will have the blessings of all those hearts whom you gave a real living qualities, you gave us voice, unity and a path to improve ourselves. I, my family and my community honors your hearts. Is Sister Rosalind’s home made? Well, we pray with all gods to provide her with her resident, what a great woman! Hugs, and lots of remembrance to her. You please keep coming to us.